After reading Loprieno's version of Middle Egyptian in Ancient Egyptian, I have some reservations. While there is no doubt that his book is chalked full of knowledge and facts about the Egyptian and Coptic languages, I can't help but think that the vowels in Middle Egyptian could be reconstructed a little better. In some cases, his reconstructions even seem a little, dare I say, implausible. For one thing, it seems to me that there is no point in reconstructing anything but a schwa for all unstressed vowels. Evidentally, based on Coptic evidence, unstressed vowels must have fell together anyway as confirmed by John Collender who writes that this event happened before the Late Egyptian period. Also, it seems to me that long vowels as predicted by Coptic might be explained on the phonetic level rather than the phonemic, based largely on the structure of the Middle Egyptian syllable (i.e. long vowels in open syllables; short vowels in closed syllables). So, for the past few months now, I've been pompously pondering on how I would reconstruct Middle Egyptian more precisely. Quite frankly, I can't say that I'm anywhere near an expert in Egyptian linguistics yet. However I do understand how languages work and I can't resist exploring new ideas. We can compare Loprieno's version of the Egyptian numerals from “one” to “ten” as exemplars of what dissatisfies me about his reconstructions and what my own mind is instinctively concocting for better or worse. I presume that Loprieno reconstructs *yifdáw '4' (and likewise John Callender reconstructs *yAssáw '6') based on Coptic --afte and -ase as in mNtafte '14', mNtase '16', jwtafte '24' and jwtase '26'. However, I wonder if this might be the result of an intrusive vowel inserted before the Coptic period, perhaps to avoid accentuation on the final syllable of a compound word since, coincidentally, it appears that both 'four' and 'six' must have had accent on the ultima in Middle Egyptian. Perhaps along the lines of: *mujə-fədá > *mujə-ftá > *mujáftə > Sahidic mNtafte. What's more, if the word 'four' is etymologically related to Hausa huɗu as is commonly understood then it's rather unlikely to me, based on both this and the Coptic reflex, that there was a prothetic syllable in this numeral and probably also in the word for 'six' for the same reason. Then again, I admit I might be missing some important fact or another so if someone can please explain why Loprieno reconstructs things the way he does, don't be shy to post me a contrarian comment. On topics like these, I rather enjoy academic disagreements over and above homogeneous consensus. Loprieno, Ancient Egyptian (1995), p.71 (see link). "British archaeologists have unearthed an ancient skull carrying a startling surprise — an unusually well-preserved brain. Scientists said Friday that the mass of gray matter was more than 2,000 years old — the oldest ever discovered in Britain. One expert unconnected with the find called it 'a real freak of preservation.'" 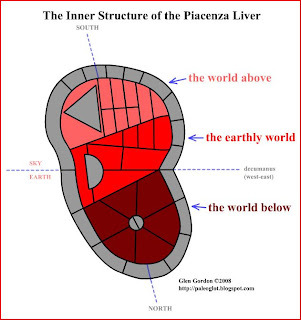 As promised, I want to share some new ideas concerning the Piacenza Liver (see pic here). 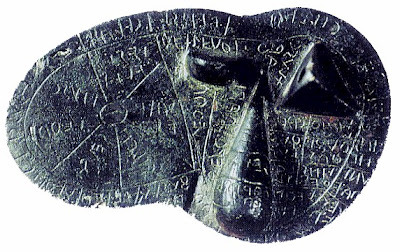 The Piacenza Liver is an Etruscan bronze model used for haruspicy (i.e. divination using sheep's livers) for those that aren't familiar with it. Despite the fact that this object was retrieved in 1877, the full meaning of this object and its relationship to Etruscan mythology remains an infuriating mystery. Perhaps I'm an impatient fellow but as far as I'm concerned, there are many mysteries that strike me as not being true mysteries, but rather artificial mysteries that our society holds onto like a security blanket against the "fear of the known" that presumably makes life more dull. As for me, I can't resist a good puzzle to solve, so to each one's own. Maybe this seems a little Dumezilian, however I notice that the inner portion of the artefact can be arranged into three equal parts that may relate to a tripartite world-view of celestial, earthy and infernal worlds. This would then imply that the wheel like structure of six portions may relate to the underworld while the deities next to the "mountain" on the other lobe of the liver may relate to the goings-on of the heavens. In the center, where we find the heroic demigod Heracle and an unknown deity named Methlumth (n.b. meθlum means "people"), priests may have prophecized more on matters of the physical, earthly world of humankind. I have a lot more to say but chew on that for a while. I'll be back. Sorry that I've been busy, everyone. However I have a fresh entry just itching to be written about the Etruscan Piacenza Liver, a bronze model of a sheep's liver created for the ritualistic practice called haruspicy in order to divine the future. It's clear that this quirky practice originated from the Near East and there are similar Babylonian liver models fashioned many centuries preceding Etruscan civilization that I've compared on this blog before. The only tricky part is the fact that the Etruscan liver model and the Babylonian counterparts don't seem to coincide very nicely together aside from some general similarities. I've never found any author who has adequately explained the entire significance of this Etruscan artefact in ritual and mythology. Explanations are always vague with little to offer, not even a plausible theory. That being said, after obsessing over it this past week, I noticed some new and interesting patterns that I want to share with everyone involving the mysterious interior sections marked with names of deities. While the outer border is plainly representive of the 16 directions of the cosmos, the inner sections seem to be connected to less well-known mythological structures or concepts that are important nonetheless to our understanding of Etruscan world-view. On one lobe of the liver there is a circular structure of six deities while on the other lobe there appears to be a mountain-like structure under which lie eight deities. Then there is a central flat section which doesn't seem to be connected to the two opposing, aforementioned structures as well as a fourth, the teardrop structure corresponding to the gall bladder which is allotted to four more deities. My question is this: What do these structures signify and why are they placed in this way? Well I think I have a lot to say on this now. Teehee! So stay tuned and in the meantime see if you readers can make sense of the Piacenza Liver inscriptions as pictured above.